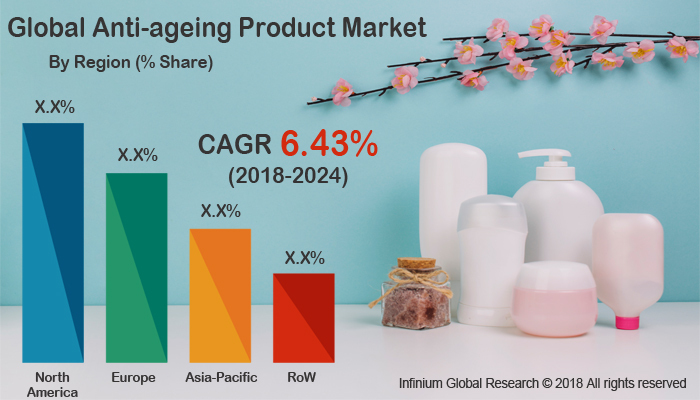 A recent report published by Infinium Global Research on anti-ageing product market provides in depth analysis of segments and sub-segments in global as well as regional anti-ageing product market. The study also highlights the impact of drivers, restraints and macro indicators on the global and regional anti-ageing product market over the short term as well as long term. The report is a comprehensive presentation of trends, forecast and dollar values of global anti-ageing product market. According to report the global anti-ageing product market is projected to grow at a CAGR of 6.43% over the forecast period of 2018-2024. The normal chemical, biological and physical change in the body cause aging. The aging causes facial and body wrinkling of the skin. The anti-aging products are designed to diminish the effects of aging. To hide the effects of ageing and to alter the body's chemical balances to slow down the physical effects of aging there are number of products available in the market. The products available in the market promise of making the customer look younger by reducing, covering or precluding signs of skin aging. The unhealthy lifestyle and eating habits such as consumption of packed food, alcohol and smoking leads to early aging of the skin. The ingredients used in anti-aging product are retinol, alpha hydroxy acids, matryxil, coenzyme Q10, acetyl hexapeptide-3, anti-oxidants, and, vitamin C. The antioxidants present in the anti-aging products helps to keep the skin hydrated. The demand for anti-aging products is increase among the adults age group between 25 and 40 to hide the effect of aging caused by unhealthy life style. Additionally, the rise in the geriatric population is another factor that will promote the growth of this market. Moreover, innovations and development in anti-aging products and their enhanced effectiveness is likely to drive the market in the coming years. The introduction of safe and efficient anti-aging products in the market and are expected to drive the anti-aging market in future. On the other hand, the side effect of the product such as redness, irritation and cystic acne is likely to hamper the growth of the market. Furthermore, the leading players are focusing on different range of anti-ageing products are likely to bring more opportunities to the market. Among the regions, North America is expected to be the largest market for anti-ageing product. The rising of aging population and new technological advancement in anti-aging products is driving the growth in this region. The U.S. dominate the anti-aging product market in North America. The change in lifestyle, increasing per capita income and availability of variety of product from different brands is likely drive the growth of Asia-Pacific region. China is the major contributor for the fast growth in this region. The innovation and new product launch are the key strategies of the leading player in this market. For instance, in 2017, Avon receives patents for skincare technology ANEW Reversa list Infinite Effects. A product is a rotational anti-wrinkle night cream, for dramatic results on wrinkles that get better over time. The report on global anti-ageing product market covers segments such as, product type, end user and distribution channel. On the basis of product type the global anti-ageing product market is categorized into anti-wrinkle, anti-stretch mark, cell renewals, acne creams, hair care products, natural products, uv absorber and others. On the basis of end user the global anti-ageing product market is categorized into below 25 years, between 25 and 40 and 40 years and above. On the basis of distribution channel the global anti-ageing product market is categorized into supermarkets/hypermarkets, cosmetics stores, dollar stores, online retail and others. The report provides profiles of the companies in the global anti-ageing product market such as, Revlon, Photomedex Inc, L’Oreal, Lotus Herbals, Unilever, Avon Products, Estee Lauder, Johnson and Johnson, Rachel K Cosmetics and Others. The report provides deep insights on demand forecasts, market trends and micro and macro indicators. In addition, this report provides insights on the factors that are driving and restraining the global anti-ageing product market. Moreover, IGR-Growth Matrix analysis given in the report brings an insight on the investment areas that existing or new market players can consider. The report provides insights into the market using analytical tools such as Porter's five forces analysis and DRO analysis of anti-ageing product market. Moreover, the study highlights current market trends and provides forecast from 2018-2024. We also have highlighted future trends in the anti-ageing product market that will impact the demand during the forecast period. Moreover, the competitive analysis given in each regional market brings an insight on the market share of the leading players. This report will help manufacturers, suppliers and distributors of the anti-ageing product market to understand the present and future trends in this market and formulate their strategies accordingly.